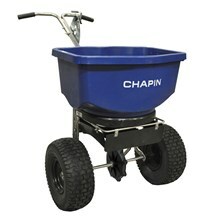 Chapin Professional Spreaders were built to provide all of the features and functionality needed for reliable, efficient performance. 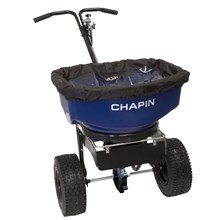 The 100-Pound Salt and Ice Melt Spreader has a large, 2 piece hopper design that boasts stainless steel handles and a rugged stainless steel frame, solid linkage for full gate control, spiked auger to help move salt and tear through clumps, 14″ pneumatic tires for just about any terrain, front and side baffle system for precise control of spread pattern and enclosed metal gears with grease fitting to withstand the elements. Protective rain/snow cover included.